The Eureka Midori is heavy and bulky when packed but it has the most floorspace as well as the highest peak in the set. The Midori performs well in the shoulder room area. It has the highest peak of the tent set, and does well in both vestibule area and floor area. The body of the tent is almost all mesh, which adds to comfort on the nights you feel brave enough to fall asleep without the fly on. The Midori packs up into a large roll that is bulky for one person to carry on their own. It is also on the heavy end of the spectrum, with a minimum weight of six and a half pounds. The bags for the poles and stakes lack long term durability, and use drawstring ties. First time solo setup for our tester took 6:40. 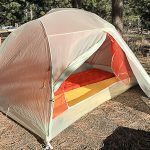 This is a tent that is relatively easy to set up with one person—it is a simple dome tent with no threading. 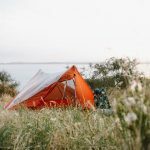 With the Midori, Eureka has taken the basic dome tent and added a bit of reinforcement, to the seams, the corners of the fly, and to the corners of the body. 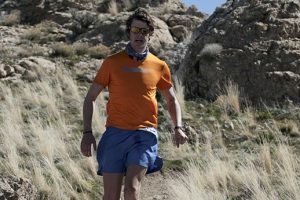 This adds to the overall weight but provides a basic level of sturdiness for windy conditions. The poles are a lightweight aluminum. 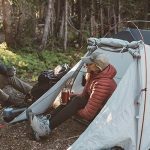 The Midori features a very large loft-style cargo net that can handle a few pieces of outerwear or other small items, but it’s not something you want to put much weight in or it will pull on the pole structure. There are two doors, two medium sized vestibules, and the fly has double zippers. There are also two optional vents near the top of the fly, one on either non-door side.